2072. Glazed-roofed plant-houses are of various forms. The earliest and simplest is the common lean-to or pent-house shape, which is still common in nurseries, though it is now rarely used in ornamental gardens except in the forcing department. The simplest and most economical hothouse of this description may be compared to a large pit. The back and front walls and ends being of masonry, and a sloping side above of glass, either fixed or movable; if fixed, then air is admitted by openings in the front wall and top of the back wall; if movable, the sashes slide, or are moved in grooves, the lower one being drawn up, and the upper sash let down. Such a house will succeed perfectly well for grapes and pines. The first improvement on this form consists in forming moving glass frames in front, instead of the opaque wall of masonry and shutters; and a second consists in adding glass ends (fig. 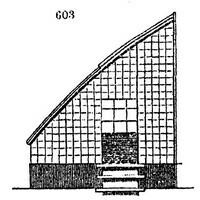 603.). Span-roofed plant-houses are formed of two lean-to roofs joined together, as shown in fig. 604.; and this form is generally adopted for the show house of a nursery. Houses of both these forms are admirably adapted for the growth of small, compact, bushy plants, as they can be placed near the glass and have the full advantage of air and light. In long narrow houses, also, a high degree of perfection in growth may be obtained with the greatest possible economy, as a considerable portion of the heat maintained in the house is obtained from the sun. In houses of this description the power of the sun's rays is 'great on the atmosphere within, inversely as its cubic contents, compared with the superficial contents of the glass enclosing it.' (See London's Horticulturist, p. 188.) Thus, suppose one house to be 20 ft. high and 20 ft. wide, and another to be 20 ft. high and only 10 ft. wide; in the wide house, every square foot of glass has to heat upwards of 7 cubic feet of air, but in the narrow house only about 4.5 feet. For early and late forcing, narrow houses with upright glass, or glass at a very steep slope, are preferable, as giving but a small volume of air to be heated, and as admitting the sun's rays at a right angle at those seasons when it is low in the horizon, and above it only for a short time. For growing herbaceous plants, and for the general purposes of propagation, whether by seeds, cuttings, or layers, a low narrow house, in which all the plants can be placed near the glass, is by far the most convenient form.